Sawi? Marupok? In-Love? Trying to move on? We’ve all been there. As February nears, a lot of shops and malls start to join in the festivity by showering every single corner with red hearts. This may bring a little pressure and insecurity, (single pringles, anybody?) As a result, you may be a bit stuck on what to do as this season of love dominates every aspect of your surroundings. If you’re single, you may be a bit clueless on what to do to maneuver that “single feeling” while seeing all the couples out there. Maybe you might even feel a little lonely. However, if you’re not single, maybe you’re looking for what to make that special someone’s day extraordinary. Don’t fret. 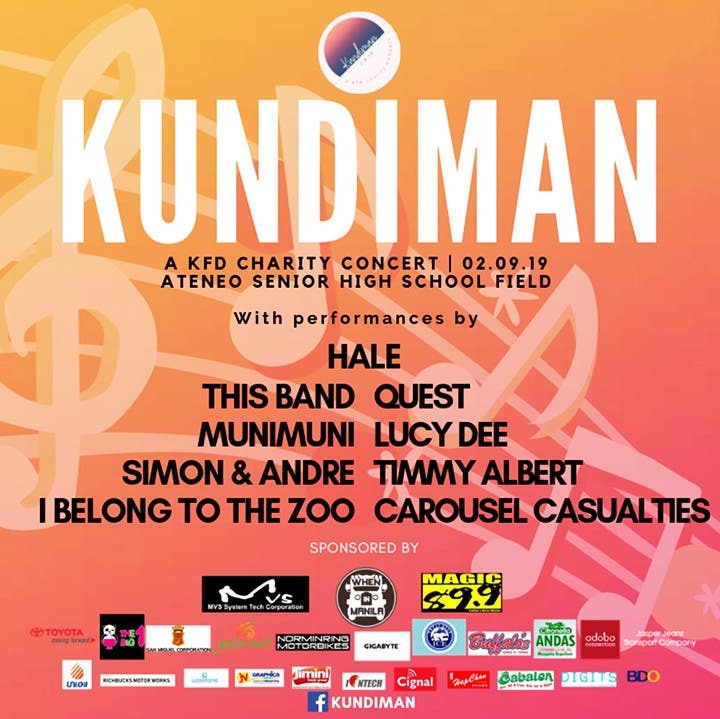 Presenting Kundiman, a charity concert for the partner institutions of the Ateneo de Manila University. Artists such as Hale, Quest, Timmy Albert, Munimuni, I Belong to the Zoo, This Band, Carousel Casualties, Simon&Andre, and Lucy Dee will be serenading your heart under the starry midnight sky. It takes place on the Saturday right before Valentines, February 9, from 6 p.m. to 12 mn at the Ateneo de Manila Senior High School Field. This is the perfect timing to celebrate all kinds of love. Bring your friends, loved ones, that (about to be) special someone, or go solo. Tickets are only priced at php 350 until February 8 and can be pre-ordered through the link (tinyurl.com/KundimanTickets) below or purchased at P400 on the day itself. Check out their Facebook page at https://www.facebook.com/kundimanconcert for more information and content regarding this event! Participate in their contest for the chance to win free tickets and other prizes (such as a picture with an artist!) or just sit back, watch, and daydream with our Life’s Love Songs Video series.